Humans have their own definition of what beauty looks like take a look at beauty routines from the past. This trend was popularized in China, but it was also common in Japan, Vietnam and Thailand. Though mostly women painted their teeth black, men would occasionally do the same; having black teeth was considered a sign of aristocracy and coming of age. This was especially common for women, it meant that they had reached maturity and were now prepared to become wives and mothers. The paint was surprisingly useful for the prevention of tooth decay. This paint was iron-based and contained aromatic spices and cinnamon. This practice can seem shocking to us today, especially with several beauty ads that tell us that having a porcelain smile is what we must aim for. This trend was popular until the end of the nineteenth century, but it is still practiced by small groups of women in rural parts of Asia. This trend would not gain any type of following today. With our trend of various beauty products that promise that they are “natural” or “organic”, will not block pores, harm skin, or adversely affect our complexion, it can seem hard for us to even think of slathering a paste on our faces that contains lead (which is poisonous in the long run!). 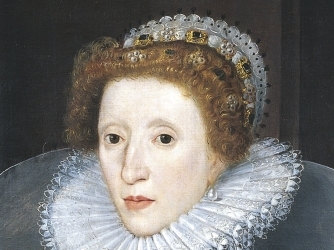 During the Elizabethan Era, a pale complexion symbolized beauty, wealth and nobility. This is why many men and women of high society covered their faces with it daily, and were rarely seen without it. Side-effects of this trend were usually baldness, weakened teeth and blackening of the skin. Definitely not worth it! How does a green tea mask, or a natural fruit mask sound? Good for us, but in Ancient Greece and Rome their beauty trends consisted of bathing in a mixture of mud and crocodile dung and spreading it all over the face. It was believed that the excrement had a brightening and age-defying effect on the skin; if you could somehow get over the smell of dung on your body and the idea of spreading animal feces on it, the fountain of youth was yours! This trend was also common during the Elizabethan Era. Due to the lead poisoning from the white paste people wore to beautify their complexion, hair on the face such as eyebrows and eyelashes would often fall out, due to this side effect, many ladies resorted to using mouse fur to replace the eyebrows. Ladies usually caught and skinned the mice themselves. The mouse fur was carefully glued on the face to simulate full eyebrows. Highly unsanitary? Yes, but Elizabethans certainly made the best of the situation! In Ancient Rome, wealthy people would buy urine shipped directly from Portugal because they believed Portuguese urine to be very potent. The urine would often be used as a mouthwash to maintain clean, white teeth! Though this is very unhygienic and not likely to be recommended by any licensed dentist, urine contains ammonia molecules which do help whiten teeth. Gargling urine? Probably not the best idea, but at least it had the desired effect. Today, many people resort to waxing, shaving, threading, and special creams to remove any unwanted hair. However, during the 1940s, wartime scarcity limited many hair removal options. Women would remove unwanted hair by buffing their bodies with sandpaper. That sounds like quite a painful price to pay for smooth, hairless skin! Though this hair-removal method did not remain popular for long, some people today still view sandpaper as a useful tool for hair removal. From using crocodile feces to beautify the skin, to gargling urine for a beautiful smile, humans have certainly come up with several fascinating beauty routines to keep up with beauty standards. Though today we don’t have many routines that are as extreme or dangerous as the ones on this list, being part of a modern society opens the door for other modifications in the name of beauty, such as plastic surgery. People from the past were certainly willing to go to extreme efforts for beauty, but at the same time, isn’t our culture doing the same?